A percussive therapy device used by athletes like Antonio Brown, that loosens stiff, sore muscles in a handheld device. Professional-grade percussive therapy combines the science of our 16 mm amplitude, frequency, and torque - the essential triad required to relieve pain, improve movement, and aid in recovery. The G3PRO uses these three principles to speak to your body in a language it can understand. Amplitude: Our proprietary 16 mm amplitude provides deep muscle relief, and overall recovery, decreasing pain and increasing range of motion. Frequency: The G3PRO operates at a frequency of 2400 RPMs, the optimal calibration for encouraging the Gate Control Theory of Pain - essentially overriding your brain’s response to pain. Torque: With a high-quality industrial-grade motor, the G3PRO can withstand up to 60lbs of pressure. Without stalling. We worked closely with mechanical and sound engineers from MIT to design the functional elements of the new G3PRO. They fully redesigned our gearbox from scratch, and reduced the overall noise levels without sacrificing our strict performance requirements of amplitude, frequency, and torque. With the newly-crafted gearbox, high precision machinery, and state-of-the-art sound insulating techniques, we were able to reduce the noise of the gearbox by more than 50% from our earlier models. The G3PRO is physician-calibrated and ergonomically sound. Perfectly weighted for a 50:50 balance, our unique design is expressly made for optimal use for professionals with zero stress or pressure on forearms, wrist, or hands. The ergonomic handle and grips allow you to simply float the device on the body, and let the G3PRO do all the work. "Health is wealth. It's so important to take care of your body. I use the Theragun before and after workouts, anytime I'm sore. Blood flow is important for every athlete to be their best! It's not just important for football, it's important for life. The Theragun is always with me, it's like my ID badge!" Everyone has a tennis ball. But our attachments have been precisely engineered to cater to everybody’s needs. Our wide range of G3PRO attachments offer a different shape and level of firmness, and are expertly designed to treat the unique needs of all muscle groups. The new attachments glide easily on the skin and clothes. Lotions, oils, and sweat can now be easily wiped away with our closed cell PU foam, making the attachments more hygienic. The attachments are fast and easy to swap out, allowing for speedy treatment. The G3PRO’s 4 adjustable angles allow for different fascial and muscular needs, creating the perfect, ergonomic angle to achieve its maximum potential of treatment - whether you’re treating yourself or others. 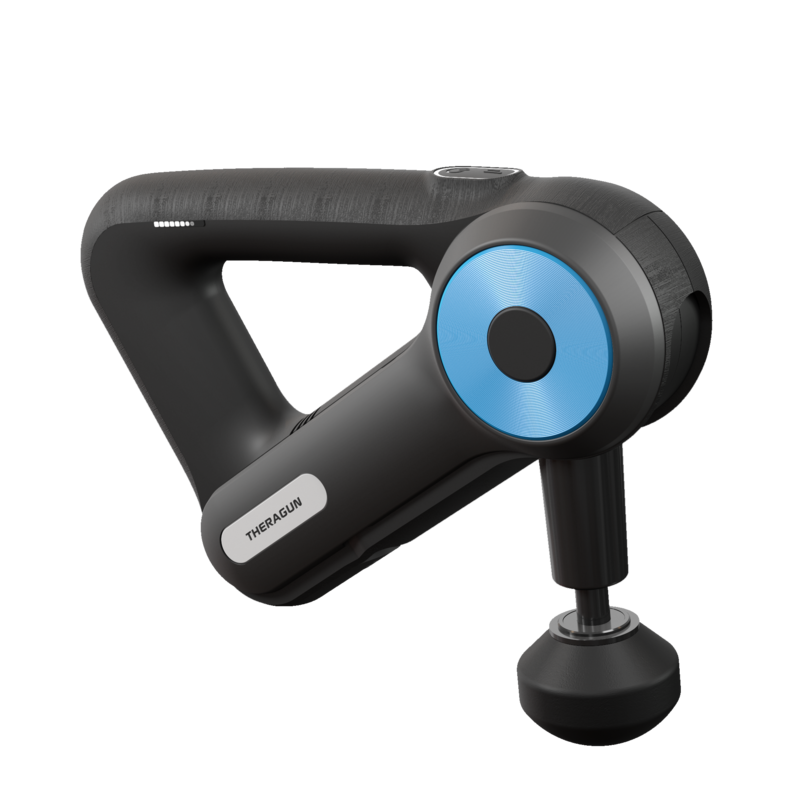 The G3PRO’s articulating arm provides essential ergonomics to maximize the effects of percussive therapy. Critically, our proprietary ergonomic design alleviates pressure from the user’s joints, wrists, elbows, shoulders, while still providing a highly effective treatment. The device is doing the bulk of the work for you. As the 7th generation product of Theragun, the G3PRO is the culmination of 10 years of research and development, testing, and constant scientific improvements. We don’t just make a new product. We make a new product that lasts. To that end, we put the G3PRO through the ringer with countless quality control tests, creating more extreme drop tests, testing for effectiveness, functionality, durability, quality, and state-of-the-art ergonomics. We’re our own harshest critic, and reject anything that doesn’t meet our exacting standards. We’re so confident that we offer an industry-leading 2-year warranty.